Working in the Medieval History Portfolio Classic or Junior requires the student to be the journalist and to “Tell the Story.” The Portfolio’s table of contents and notebooking pages facilitate this process by providing a clear and detailed outline with topics and essential sub-topics. Notebooking activities are multi-level, but always involve age appropriate research, reading, writing, and illustrating. This process has been designed to provide the requisite skills for self-directed study. The Medieval History Portfolio Classic is for ages 9 and up. 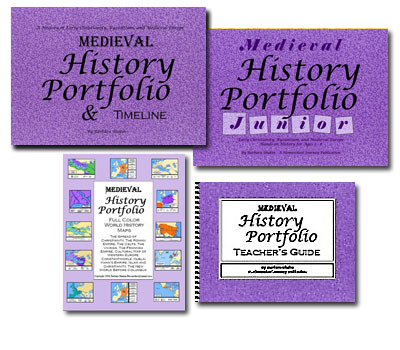 The Medieval History Portfolio Junior is for ages 5 — 10. All Portfolio notebooking pages are formatted with a unique system of “image boxes” and “text boxes,” providing an overall pleasing composition especially as written work and images are added. Chapters in both the Classic and Junior volumes are: The Christians: Pentecost–1054 A.D., The West Roman Empire, The Celtic Tribes, The Germanic Tribes, The Building of Kingdoms (Medieval England, France, and Germany), The East Roman Empire/Byzantium, The World, and The Roots of the Renaissance: 1100–1300 A.D. Useful black-line maps are provided within each chapter. The Medieval History Portfolio Classic also includes a unique consumable timeline. 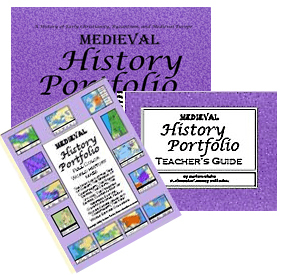 Essential companion products for the Classic Portfolio are the Medieval History Portfolio Teacher’s Guide and Medieval Full Color Maps. The companion product for the Junior is the Medieval Full Color Maps. Students using the Medieval History Portfolio Classic will be steadily guided throughout the process of completing a Portfolio. First, the table of contents and the separate, consumable, Teacher’s Guide will provide a detailed spine. Following the spine, the student then proceeds with age appropriate research and pre-writing activities, sorting information and writing reports, illustrating reports with relevant images, and adding the reports and images to the notebooking pages of the Portfolio. For each time period, Ancient, Medieval, Renaissance, and Modern, the student creates a unique, keepsake-quality, record of their journey through history, while developing the essential research and writing skills required for independent, self-directed learning. The Medieval History Portfolio Teacher’s Guide is designed to be used in conjunction with the History Portfolio. While the Portfolio suggests topics for each page of the Portfolio, the Teacher’s Guide focuses the direction of research by suggesting essential, not-to-miss, topics and sub-topics for each and every Text Box and Image Box on each page. The Teacher’s Guide suggests vocabulary words, names of important leaders, artists, and scientists, and indicates minor associated events, inventions, architectural monuments, etc., for supplementary research. Because words are not always enough to tell the complete story, the Teacher’s Guide provides numerous, black-line, cut-and-paste illustrations and diagrams. 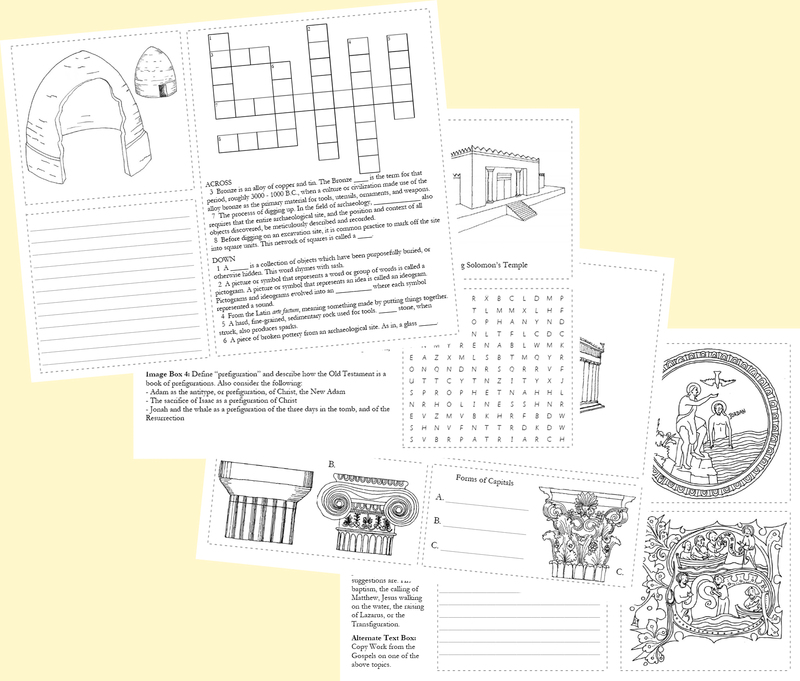 Bonus puzzles and activities for reinforcement and review are also included. 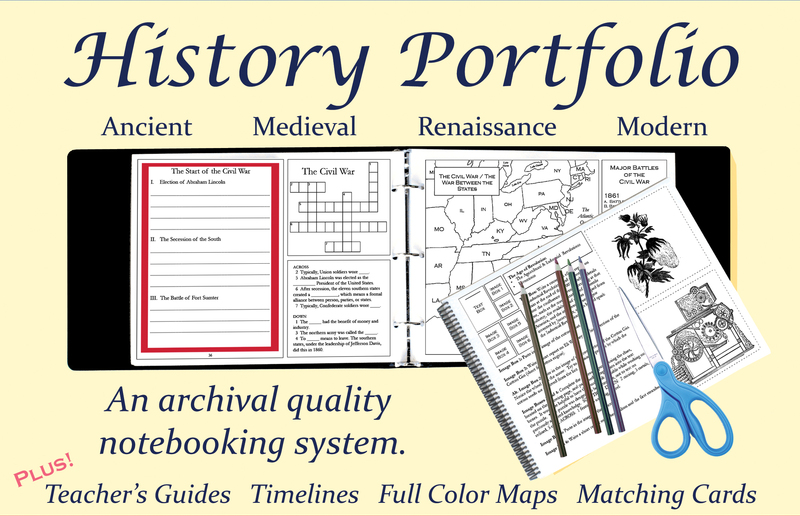 The Medieval History Portfolio Full Color World History Maps provide reference maps for every black-line map in the Portfolio. Only one set of Ancient maps is needed for each family. 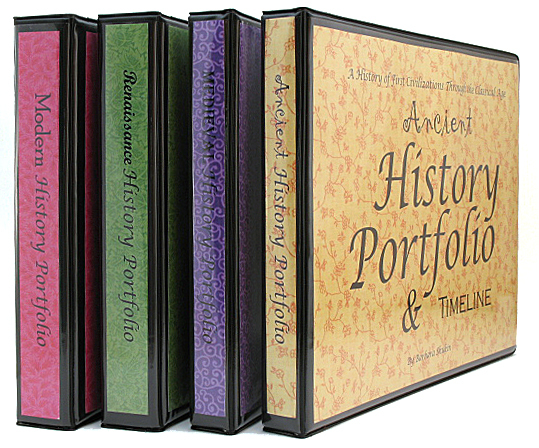 The Medieval History Portfolio Junior is a modified version of the Classic Portfolio. The Juniors contain the same chapter titles, in the same order as the Classic volumes, to allow older and younger children to work side by side. The Junior, however, has fewer pages and therefore requires much less writing. It has been designed for children in the following groups: the child who is 8 - 10 years old, capable of giving and writing short narrations; the child who is ready for copy work, but not yet ready for narrations; and the child who is ready for school work, but only very basic writing activities. Notebooking activities focus on observation, comprehension, penmanship, copy work, memory work, beginning writing skills, and plenty of games and puzzles for reinforcement and review. The Junior comes bound with its own junior version of the Teacher’s Guide, a bibliography, plus an end-of-the-year Bingo game set. Click HERE to see the handy list of recommended sources, with Amazon links, for each chapter in the Medieval History Portfolio Classic and Medieval History Portfolio Junior.